The 31st International Young Physicists' Torunament took place from the 19th to the 26th of July at RDFZ Yizhuang Campus in Beijing, China. At the tournament the team comprising of David Tschan (Captain), Daniel Gotsmann, Daniil Lozner, Piotr Salustowicz and Jakob Storp came 10th. 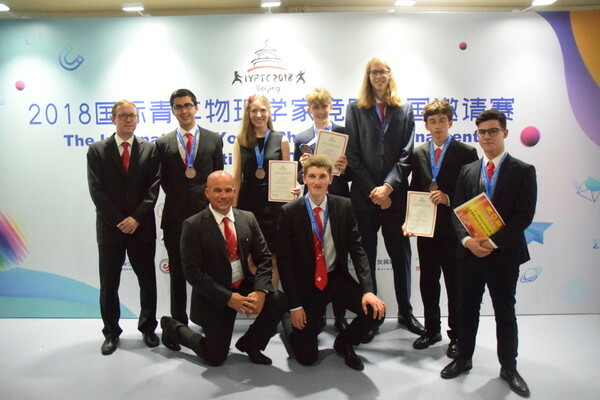 The five students were accompanied by Emilie Hertig (Team Leader), Eric Schertenleib (Team Leader, IOC), Daniel Keller (Juror) and Samuel Byland (Juror, EC). Congratulations to a successful tournament! After having decided to participate in the team qualifications for the IYPT, I was assigned a new problem to work on for the next three weeks: problem number three, Dancing Coin. Prior to giving my consent to keeping on the work, I had had a meeting with the principal of my school and Mr. Weiss, during which I was assured that I had the full support of GKG behind me, that I would be allowed to not visit certain classes and to work instead. Furthermore, and perhaps most importantly, I was given a key with which I was able to access the school and the physics facilities. From that point onwards, I probably spent more time in the lab than in classes. The setup that I used for Dancing coin required a few tries until it worked. However, once it did, it proofed invaluable for I was able to measure all the relevant physical entities relatively easily. The team qualification came quickly: on 16th and 17th of April, it was held at MNG in Zurich. We had a few physics fights and an exam, and on the evening of April 17, the team was announced. Team members were Daniel Gotsmann from MNG, Piotr Salustowicz from MNG, Jakop Storp also from MNG, Daniil Lozner from an International School in Zuoz, Grison, and myself, chosen to be the captain of the delegation representing Switzerland at the 31st International Young Physicist’s Tournament held from July 19th to July 26th in Beijing, China. Departure was on Tuesday, July 18 at eight at night. At the airport, the entire Swiss delegation charged their laptops to be able to work on the flight to Beijing. The flight was conducted by Air China, a ten-hour long-haul flight, five or six hours of which I spent working on my problems. After arrival in Beijing, we were greeted by dysfunctional trains at the airport, prolonging the time it took to get out of the it by several hours, and once we were out of there, by heat, smog, humidity and lots of people. We were picked up by our local supervisor and brought to our hotel, one that did not inspire a lot of confidence from the outside. Inside, however, it proofed rather luxurious. After a nap and dinner, we worked until 2 a.m. and then went to bed. The next day, we had our transfer to the campus of Renmin University of China at 10 in the morning. Upon arrival, we went to lunch and afterwards inspected our rooms. They were quite alright, even though the beds were very hard, and the bathroom needed some getting used to. After this, we assembled in my room and worked until dinner, and afterwards until late at night. The next day was the opening ceremony, in which the groups for the first round would be drawn. As team captain, I was the one to draw, and we happened to be in the same group as Germany and Austria. The first physics fight was in the afternoon. I presented my bottle flip, but I was a bit disappointed as the grades I received were not as high as I expected them to be. Daniel and Jacob, however, did well on their review and opposition. After the fight, we had dinner and went to Eric’s and Mister Keller’s hotel to work. The next day, round two, was a fight of four against the United Kingdom, Bulgaria and Thailand. We won that fight, and Daniel presented Blowing Bubbles, the problem that we worked on the least and would go on to be our best presentation. In the afternoon was the first excursion to the temple of heaven, a fast arrangement of temples and gardens. It was very beautiful, even though it was smoulderingly hot. Then it was dinner and, something we have become used to, working at the hotel of Eric and Mr. Keller. The next day we had two fights, one against Iran and Slovakia, and the other one against Hungary and Chile. After a long and exhausting day, we went to the hotel for one last time to work and prepare the final round against Poland and the Ukraine. I was to present Dancing Coin, and we all were feeling rather confident about it as it was a strong solution. As it turned out, however, it was not that strong, as the scores again were below our expectations. On the evening of this day, we knew our result. We had come in tenth, unfortunately missing the silver medal by 0.2 points. Bummer! The following day was a lot of fun. We went on a city tour where we got to see some sights such as the Forbidden city and the Hutongs. The highlight of the tournament, the final, followed on the next day. It was between Germany, Singapore, China and Korea. I was lucky, as the solutions presented contained two problems which I had been working on as well. It was very astonishing to see that my ideas and solutions were really good, even in comparison to the finalist’s, but they were lacking some key aspect, or did not include enough experimental verification. Singapore won the final in an utterly mind-blowing manner by presenting Azimuthal-radial pendulum – they simply had everything. Any scenario possible was accounted for and simulated. It was very impressive. After the final, the closing ceremony took place. It was rather long and dull, but we proudly received our bronze medal. Then we dined and packed up. The next day we had managed to get a tour along with Sweden and Russia. We again visited the Forbidden City and went inside that time, Tian’men square, the Hutongs, and the undoubted highlight, the Great Wall of China. Then we had a transfer to our hotel at night. We started the next and last day in Beijing by visiting the Panjiayuan flee market, and the central stopping street. Then we went to the art district, a very hip and new-wave area of Beijing. Back at the hotel, we had dinner and refreshed ourselves before heading out to the airport at 1 a.m. in the morning to catch our flight back home. Reflecting upon the experience of IYPT, the value of it becomes very clear. Not only was I able to see where my own strengths and weaknesses laid, but the work in the intense time before and during the IYPT has deepened my physical understanding considerably. In conclusion, it has therefore been a very good experience, one in which a lot can be learned and, in spite of requiring a lot of time investment, one that was very interesting and challenging.